Lisa, Joe and their children spent their summer vacation here last week and one day, took a tour of the lake on a boat. What an incredible sight they saw. 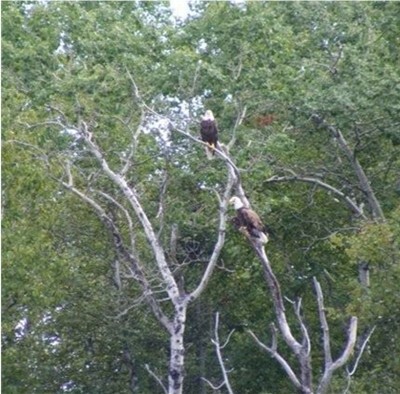 Lisa thought these were mom and dad eagles but they almost look brown to me. Either way, beautiful! …It is so peaceful here. Relaxation is so easy to do. Went to Quebec for a day trip. Jackman is a nice laid back mountain town. Tami was wonderful. She made us feel we were at home. Dani & I had a chance to totally unplug and chill out….not much wildlife was seen but we didn-t make an effort to see any either. As most of our usual guests know, we enjoy wildlife and really do appreciate the waterfowl that enjoy the waters and the shoreline of Big Wood Lake. Geese are one of those birds. The geese family are now happy and out on the lake enjoying the rainy day. 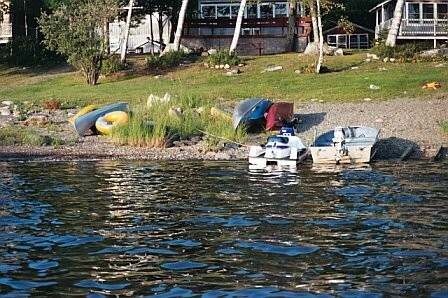 Many of our guests have asked about renting a pontoon boat to cruise Bid Wood Lake. You now have that opportunity. A member of the community is now offering daily sunset cruises to set sail from the public landing down the road. 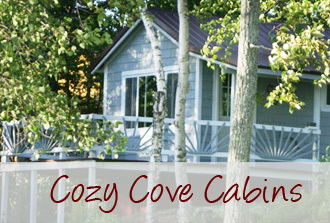 Enjoy the fantastic sunsets, hear the loons, visit the eagles nest and see what wonder lies beyond our shores. I do not believe she will rent it out to you but offers not only the sunset tours but also private trips for special occasions or groups. When you make your reservation, you can ask us for more information. Big wood Lake water is still very high. In the past, by this week, we have had most of our yard and were able to put the dock out. Not this year. Hopefully, there will not be any rain in the near future so the water has time to go down a little more. We seemed to have gone from winter to spring in a matter of days and yet isn-t this almost summer? The birds are flitting around making their nests and preparing for the young; the yellow finch have found our feeder- it is amazing how many can hover around that feeder; the song of the loons has been echoing across the lake; and last week, we got some great clips of a woodpecker on an old birch tree (check out the video on Murphy-s weather report). LOVE this time of year! We are looking forward to a great summer in Jackman. We hope to see you soon. The following is a quote from a guest this past Memorial Weekend.